Suffolk University and the Boston Herald sponsored a debate this morning between the four candidates for US Senate. For their closing statements, they were asked what they will do if not elected to the Senate. Steve Pagliuca, at 62:55 in the linked video, says he will work to build a $3 billion complex on Harvard property in Allston. He says he has momentum from businesses to help fund it and momentum from universities to be part of it. Considering that the Science Complex Harvard started building was a $1B project, he certainly is setting his sights high. Nice to see our neighbor trying to improve an important part of our shared public transportation system. Capuano, Pagliuca, and Khazei will be at BC Law school for a public forum on Monday at 5:00. Space is limited, so RSVP to bclsforum@gmail.com. Benjamin Forman, senior research associate at MassINC, and author of “Going for Growth: Promoting Residential Reinvestment in Massachusetts Gateway Cities’’ writes in today's Boston Globe about the many reasons why our housing policies should be changed to avoid "concentrating more poor families in areas where jobs have become increasingly scarce" and that "it will be difficult to make gains on stalled efforts to close educational achievement gaps as long as we continue to concentrate poor students in urban districts". Harvard, Charlesview, and the BRA apparently still haven't figured this out. They prefer to build a segregated new Charlesview instead of the integrated development that is possible. What a shame for the residents of Charlesview and our entire neighborhood that expediency may trump excellence. Globe endorses Khazei for Senate! Globe front page story builds on what has previously been reported by Bloomberg, Vanity Fair, and others about the risks that Harvard took to fund projects including its planned Allston expansion. "Under Neil Rudenstine, Harvard’s president from 1991 to 2001, cash was heavily invested in the endowment and surged from $290 million to $2 billion. Under Summers, the figure more than doubled again, according to a compilation of the data obtained by the Globe. The big project on Summers’s agenda: Harvard’s expansion across the river, into Allston." “We hope that the BRA and the mayor are acknowledging the important discussions that need to take place before the project can be approved,” said Harry Mattison, a member of the Allston-Brighton North Neighbors Forum. Mattison hopes the Brookline Machine site can be developed alongside the Charlesview apartments, whether by TCB or a private developer. The ABNNF sees the Brookline Machine site as a potential location for additional housing and park space, according to Mattison. “We hope that this [the delay] will be really as short as possible. And the result will be a vastly improved Charlesview that will set the right tone for subsequent development in Allston-Brighton,” said Mattison. Thank you to the many neighbors who generously contribute to making this a better community. Will Menino help heal the Harvard-A/B rupture? Thanks to Renee Loth for joining the chorus of residents who hope Mayor Menino will more forcefully intervene on behalf of the Allston/Brighton community. Leasing vacant storefronts would be a great start. But I'd agree with Emily Rooney that many of these buildings, especially after sitting vacant for years, may not be viable. And "storefronts" are only a small fraction of the vacant land, warehouses, and commercial buildings that Harvard has been landbanking that deserve a more active future. These benefits were intended to complement the construction of the Science Complex. The Science Complex itself would have created many benefits for this community, as some of the 2,300 direct and indirect jobs that it created would have gone to current and future A/B residents and its presence would have improved Western Ave.
Now that it appears that there will be no Science Complex in the foreseeable future, no 2,300 jobs, and no LEED Gold building improving Western Ave, whatever benefits might have made sense with the Science Complex seem inadequate as we face a future with an 8 acre concrete slab. Harvard and the BRA have made some choices about how to spend this money that does very little to improve the quality of life for Allston/Brighton residents. If we were really trying to maximize the community benefit of this money, there is no way we would spend $5.7 million on the construction and maintenance of Library Park or $500,000 on a community survey. The $4.5 million going into the Citywide jobs and housing trust funds will only benefit Allston and Brighton if it is spent in Allston and Brighton. Heal the town-gown ruptures: North Allston has a hole in its heart, after being seduced and abandoned by Harvard University. Harvard’s secret predations into Allston were bad enough, but its ambitious expansion plans are now on hold because of the crash in its endowment, leaving behind boarded-up businesses and rats. Menino ought to use a little of that pent-up political capital to “encourage’’ Harvard - and all the universities bent on expansion into Boston - to keep their commitments to the neighborhoods. Menino has sent a letter to Harvard president Drew Faust, calling on her to make sure the buildings Harvard bought up “contribute to the vitality of the community.’’ But Harvard has been slow to lease the vacant storefronts. Menino should press the university to spend its promised $25 million in community benefits sooner rather than later. While Sam Yoon only has a few weeks left on the City Council it is nice to see him continuing to work on issues that are important to him and the city. In the past I was no fan of term limits, but since then I have come around to support them because the power of incumbency is too strong and too intimidating to many potential candidates. Let good people serve a couple terms and then open the way for new people and new ideas. If we could really get to the root of the issues that create such an imbalance between incumbents and challengers I would support that instead, but in the meantime I think term limits are the best and most feasible option that we have. A bill to limit Boston mayors to two four-year terms is before the City Council's Government Operations Committee, but it isn't clear if or when Dorchester City Councilor Maureen Feeney who chairs that committee will bring the bill to the full council for a vote. Please contact Councilor Feeney at (617) 635-3455 or Maureen.Feeney@cityofboston.gov and ask her to bring this bill to a vote by the full council. Two and a half weeks ago, the Allston Brighton North Neighbors Forum asked the BRA to postpone their Charlesview zoning vote scheduled for tomorrow. The BRA Director maybe they would, maybe they wouldn't. Well, it turns out that they will postpone it, though the reason stated below doesn't mention ABNNF's request. Regardless of the reason, this is a positive development as it gives us more time to work towards the important and reasonable improvements that would make this a much better addition to our neighborhood. Thanks to Mike Pahre, Mayor Menino, and Samuels and Associates for reminding us that where there is a will, there is a way. The Boston Globe considers the post-liquidation Harvard University which includes Harvard Stadium converted into the new Charlesview Apartment Complex. The BRA today released another set of emails and documents in response to my numerous attempts to convince them to comply with the Public Records Law. The BRA Board will consider the Charlesview proposal on Tuesday at 5:30 in room 900 on the 9th floor of City Hall. In March, Charlesview planned with the BRA to have 240 apartments at the Brighton Mills site (page 4). In July, Charlesview publicly announced plans for 260 apartments at Brighton Mills. Today, in an email sent this afternoon from the BRA, Charlesview has "responded to public comments and reduced the number of apartments at Brighton Mills to 240." Was Charlesview ever serious about 260 or was this all a set-up so that they could pretend to be responsive when they made this change from their previously published plans? The BRA has no information about how Charlesview will pay for the post-construction operations and maintenance of Charlesview, despite the BRA's own insistance in its Scoping Determination that this information be provided and Charlesview's consistent problems with maintenance and generating a sufficient revenue stream for repairs. The BRA has no information about ownership, public access, and maintenance of new parks and other supposedly public areas created by Charlesview, so we don't know if the tiny parks being planned will really be open to the public or restricted to Charlesview residents and we don't know how they will be maintained. If this is how the BRA reviews a large development proposal, I am not impressed. Bikes not welcome in Boston? As an avid cyclist, I applaud Boston for encouraging more people to ride bikes. Two incidents yesterday reminded me that we have a long way to go and that being bike-friendly is about more than bike lanes and bike sharing. This letter is to inform you that securing your bicycle to sign posts or trees located along our property is not permitted. The owners work very hard to make this property attractive to the Back Bay neighborhood. There are bike racks located in the garage @ 100 Clarendon Street for your convenience. Your attention to this matter would be greatly appreciated. Now I am all for attractive property, but I disagree that bicycles are unattractive. To the contrary, I think it is great to see lots of bicycles as part of a green and healthy community. Also, if they realistically want to keep bikes in an orderly and contained location, I'd suggest some convenient bike racks. Expecting people to bring their bikes 350 yards (according to Google Maps) to a parking garage seems unrealistic. From the Hancock I biked to an appointment at Mass General Hospital and locked my bike to a sign post on the sidewalk of Blossom Street. None of the valet parking attendants who were nearby said anything as I locked my bike and entered the building. 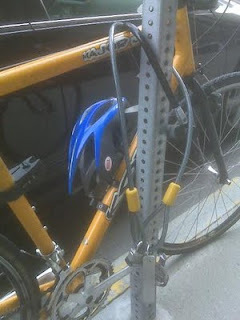 When I returned, I found a cable lock padlocked onto my bike in addition to my U lock. 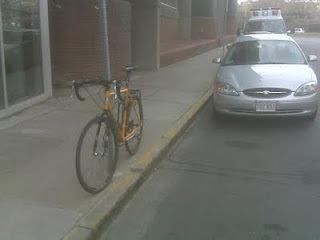 The valet told me to call MGH Security, and 20 minutes later someone arrived to unlock my bike and tell me to use a bike rack on the other side of the building. If Boston is going to create a bike-sharing program and bring large numbers of additional cyclists onto the streets of Boston (which would be great! ), the City also has some work to do with major downtown property owners who could be more welcoming to people on two wheels. While I'm not going to turn this blog into a www.kennedyseat.com rival (which by the way is a great place to learn more about the campaigns), an open Senate seat is a pretty big deal and this news from today I found both surprising and disappointing. Coakley, the state attorney general, was the only candidate to report that neither she, nor her spouse, had any reportable financial asset worth more than $1,000 - a striking disclosure for one of the state’s top officeholders. While Coakley owns her home in Medford, she indicated that she did not have more than $5,000 in combined accounts from any one banking institution during the past 21 months. Attorney General Martha Coakley, the state’s top lawyer, acknowledged today that she improperly filled out a federal financial disclosure she submitted to the US Senate as part of her candidacy in the special election. Read for yourself about the management situation at Charlesview. Charlesview knows in advance when these inspections will be done. Why didn't they correct these many easily correctable violations before the inspectors arrived? "Assurances must be clear, exact and extensively detailed in the DPIR as to how the Proposed Project, if approved, will be maintained to avoid and minimize future neglect"
But the DPIR provides no such information. Why has the BRA backed down from this requirement? If our federal and state tax dollars are going to directly fund construction of Harvard's Science Complex, then I think it would be appropriate to see some changes to the design and attitude driving that project. During the review process I noted that Harvard made bogus claims about public spaces in the buildings and the general attitude that the four-building complex was for Harvard and Harvard people, not for Allston/Brighton and its residents. So Harvard told us to keep out of the Science Complex's fitness center ("sorry, too small"), keep out of the private rooftop restaurant and bar ("sorry, security threat"), keep out of the Harvard shuttle buses (a security or insurance risk) and keep our kids out of the daycare (unless your kid is one of the 15%). Harvard designed a first floor with little retail or restaurants and eliminated the small museum-type space that was in the initial plan. Overall, Harvard chose to ignore the many opportunities to have the complex help make Western Ave more vibrant, remove town/gown barriers, and think about how this massive complex and first step in the campus expansion could also be a first step in a neighborhood renaissance. While I still disagree with Harvard's approach, if they were building the entire complex with private funds I guess you could say "it is their money so they can do what they want with it." Well, if instead it is going to be partially funded with our money then a very different attitude would be appropriate. Thanks to Emily Rooney and the Greater Boston team for this great show! Citing the recession and it's major impact on the university's endowment, Harvard continues to re-assess it's expansion plan in Allston. A number of Allston residents are upset over stalled construction and vacant buildings in the neighborhood. Tonight Emily is joined by Brent Whelan of the Allston-Brighton North Neighbor's Forum, Kevin McCluskey of Harvard University and Michael Glavin, the deputy director of the Boston Redevelopment Authority. Please join neighbors from Allston and Brighton to ask the Boston Civic Design Commissioners to withhold approval of the Charlesview project until the major design flaws with this proposal are resolved. Especially if you work downtown, in Kendall Sq, or anywhere else where you aren't too far from City Hall, it would be a great help if you can spend 1/2 hour to show that we care about the future of our neighborhood and want to improve the current proposal instead of settling for this second-rate design. Here is one example of how the current proposal could be much better. Here are 7 proposed buildings each with a thin strip (probably 5-10 feet) of grass on the sides. The block contains 24 units (18 condos and 6 apartments). Instead of backyards for these 24 units, the space behind the buildings is a 14 car parking lot. Maybe some people would be OK with a parking lot instead of a backyard, but this sure would be nicer if the parking could be added to the proposed 260-car underground garage or done with a combination of driveways, garages, and on-street parking. Would the real Charlesview please stand up? "Now nearly 40 years old, the existing Charlesview property has reached the end of its useful life and requires redevelopment to continue its legacy as a critical housing source for North Allston Brighton." - There is the Charlesview that we hear about from Charlesview's Board, The Community Builders, the BRA, and our elected officials. This Charlesview is about to crumble to the ground and must be evacuated ASAP. - There is the Charlesview that is inspected every couple years by HUD with a long list of "ordinary" problems but in need of almost no major repairs. "Would the real Charlesview please stand up?" So according to HUD's inspectors, Charlesview for the past 4 years hasn't needed any major capital improvements and in the past 7 years the only capital repair needed was new sinks in some bathrooms. At the same time, there are many smaller things not being done to HUD's standards including fences that need to be repaired, grass that needs to be mowed, light switches that need covers, fire exits that are blocked, walls that need to painted, etc. This does not support the claims that Charlesview has been fundamentally flawed since its construction or that the buildings are in urgent need of replacement. These reports do indicate that basic, regular maintenance at Charlesview has been highly inconsistent during the past several years. Thanks to the many residents of Allston and Brighton who contributed to the family of the late Fredy Zepeda. Earlier this year, Mr. Zepeda was struck and killed by a car in Brighton. His wife and child needed help and financial contributions from our community have helped them to pay their daily life expenses. Stabbing death in front of the Store24 at 157 Brighton Ave (at the intersection with Harvard Ave) early on Sunday morning. We have heard a lot of vague statements over the years about the condition of the Charlesview Apartments. Now, thanks to HUD and a FOIA request, we have public information from the past several years from independent, certified inspectors. The format and definitions of the reports are described at http://www.disasterhousing.gov/offices/reac/products/pass/pass_isrpt.cfm. When I am near a scanner I will upload the full reports, but in the meantime, here are the number of Health and Safety deductions made during each report (higher numbers indicate more problems). The April 2008 report gave Charlesview an overall score of 50 out of 100, and HUD wrote that "the inspection has been referred to the Departmental Enforcement Center for enforcement action... Properties scoring below 60 have physical deficiencies that do not meet the contractual obligations to HUD. Residents of such properties are not receiving the quality of housing to which they are entitled." However, four months later Charlesview had been able to correct almost all of these problems. This contradicts the oft-repeated statements that the condition of Charlesview is so intolerable and the problems there are too difficult to fix. One of the many great programs at the Gardner Pilot Academy in Allston is the Friday Enrichment program. This program brings a wide range of artists and other adults from the community into the school on Friday mornings to do creative, fun, and educational activities with the kids. This morning was one of the "showcases" that the school has a few times a year when the students perform and show their work to their classmates and families. Do PILOT & Allston/Brighton negotiations conflict? This story doesn't mention Harvard, but obviously if the Mayor and City Council are negotiating with Harvard and other non-profits about PILOT payments, I wonder how this impacts the negotiating that many of us think the Mayor and City Council should be doing with Harvard to allow more land in the Holton St Corridor to be developed for Charlesview and other developments. More PILOT money is of course good for the entire City, while ending Harvard's landbanking would be good for Allston and Brighton. So when the Mayor's people and Harvard's people are discussing these issues, which one comes first? "But the government and institutions are negotiating well now, Murphy said, describing positive progress. Because the city cannot legally require any PILOT deals, the agreement will rely on goodwill and political pressure. " The Phoenix takes an in-depth look at the Boston rat rampage in Allston and across the City. Nice to see another voice in support of active uses for what is now mothballed. All are welcome to join the ABNNF at 6:00 on Thursday to discuss the Charlesview relocation and Holton Street Corridor redevelopment. City Councilor Mark Ciommo will join us for this meeting which will be held in the Gardner School auditorium (30 Athol St). The race for Mayor is still within a few percentage points, but it seems clear that Mark Ciommo is heading to a victory in his City Council race vs. Alex Selvig. Congratulations to Mark and thank you to Alex for his willingness to challenge an incumbent - an uphill battle in any election but one that also strengthens our democracy and civic life. It is a surprising title for this interview, considering the intense secrecy with which Harvard's guards its plans here in Allston and "communicate, communicate, communicate” is certainly not the mantra of the Allston Development Group.